Lavender flowers bring an element of class to a garden, offering richer color than light pink blooms without being as "in your face" as deep pink blossoms (the color, lavender is a tint of violet.). 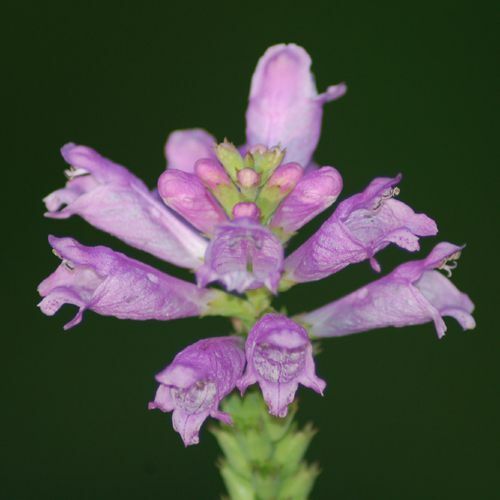 False dragonhead flowers are late-blooming perennials, as their pinkish-lavender blooms burst forth in August. Their late-blooming quality helps extend the season of floral color in the yard. This plant is a vigorous spreader and will last for years without division, but if you do wish to divide, spring is a good time. The trained eye would never mistake a 4-foot tall Russian sage plant for lavender, although one of Russian sage's other common names is "Siberian lavender." Indeed, Russian sage is a bit hardier than lavender plants are (zones 4 to 9 vs. zones 5 to 8) and might be a better option for northern gardeners seeking a "Mediterranean" look and who haven't been able to grow lavender successfully. Russian sage comes in a number of cultivars, and their respective flower colors will differ slightly, but all revolve around the lavender-blue-purple theme. The profusion of its delicate flowers, its gray-green leaves and its whitish stems all work to give Russian sage a "misty" look, making it a good choice if you're looking for a plant with a fine texture. Russian sage grows best in full sun and a well-drained soil. These perennial flowers may be herbaceous in planting zone 4 but are generally woody further south. European Pasque flowers (Pulsatilla vulgaris) can bloom in a number of colors. I found these lavender-colored Pasque flowers growing in a rock garden. Named for the Old French word for "Easter," Pasque flower is also called "Easter flower." These common names derive from the time of year it blooms in some areas. Its early blooming habit makes Pasque flower a good companion to spring-flowering bulb plants. Plant Pasque flowers full sun and in a well-drained soil in zones 4 to 8. A popular ground cover, creeping phlox flowers come in a number of colors, including lavender. Among the truest lavender-colored lilac shrubs are the 'Lavender Lady' lilacs. This lavender hydrangea picture may give beginners a look different from what they're used to. White, pink and blue are perhaps better-known flower colors for this summer classic. Hydrangea shrubs come in a number of forms and colors. Climbing hydrangeas are vine plants. A variation on the shrub-form hydrangea is the oakleaf hydrangea, grown for its unusual leaf shape and fall foliage color. Meanwhile, the flowers of some hydrangeas will vary in color depending upon whether the soil is acidic (yields a blue color) or alkaline (yields a pink color). All wisterias are stunning bloomers. Wisteria flowers in clusters (also known as "racemes") and the blossoms are fragrant. Bloom colors range from purple to white. The vine's blooms can appear anywhere from mid-spring to the early part of summer, depending on where you're landscaping. As this photo of butterfly bush shows, this perennial flower comes in a mauve-lavender color, among others. What list of lavender-colored flowers would be complete with a photo of the herb, lavender? Like tulips, daffodils, hyacinths, grape hyacinths, snowdrops, scillas,​ and other bulb plants, crocus flowers grace our yards with early spring color. Grow in planting zones 4-8 in a well-drained soil. Crocus flowers reach only 3" to 5" in height, so plant them en masse for best effect (say, 100 to 150 of their bulbs, or "corms" planted together). These early bloomers naturalize fairly easily. Their blooms open up when it's sunny, then pucker up when the sunlight retreats. The foliage of crocuses is a blade-shaped leaf with a silvery stripe down its middle. The name of the genus in this case (namely, Delphinium) is so widely recognized that it has virtually become a common name. Although the common name "larkspurs" is also in use for these plants, many people commonly refer to them as "delphinium" flowers. For a type of larkspur with a much darker flower color, see Black Knight delphiniums. Rose of sharon shrubs are available in other colors, as well: red, white and light blue. Some rose of sharon shrubs bear double blooms. The shrubs can easily reach 10 feet tall under the right conditions, but shorter cultivars are available, such as 'Minerva' (8 feet at maturity). There's a plant that grows wild in my neck of the woods (New England, U.S.) named "sweet meadow rue" (Thalictrum polygamum). That particular wildflower has white blooms. The perennial in the picture here is a different (but related) plant. Columbine meadow rue (Thalictrum aquilegifolium) is a tall perennial for planting zones 5 to 9. Its columbine-like leaves give it its name and make it attractive even when not in bloom. The plant may bear white, purple or mauve flowers and may reach 3 feet or more in height (with a width of about half that). Plant meadow rue in partial shade and in a soil kept on the wet side (wild meadow rue is a wetland plant) and enriched with humus. This perennial naturalizes well, making it a candidate for woodland gardens. As a tall plant, columbine meadow rue is also useful if you're looking for a perennial to place in the back row of a flower bed.